The pin pitch is 2.54 mm. (1) It is important to have the Test I/O GND connected to the target as the ULINKplus I/O, JTAG/SWD, and Power interfaces are fully isolated from each other and GND pins on this interfaces are not identical. 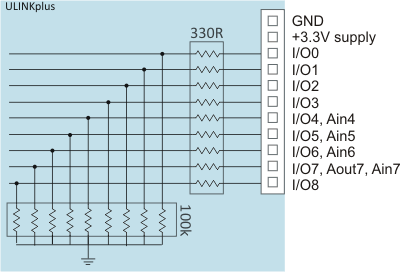 (2) The switchable +3.3V pin can deliver up to 10 mA current.